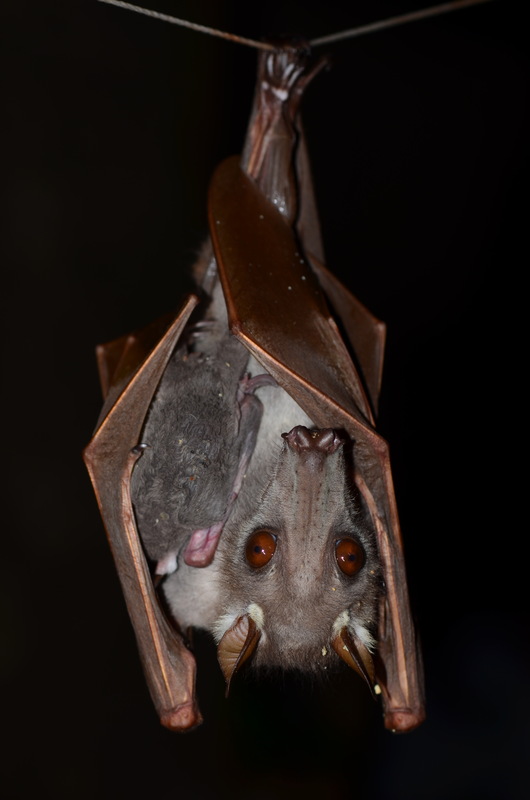 This female hammer-headed fruit bat (Hypsignathus monstrosus) makes commuting with her pup look so easy. 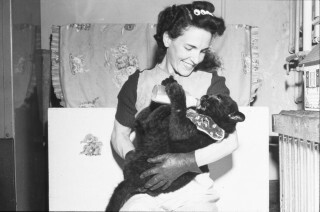 The pup clings on by nursing and grasping tight with both feet and thumb claws. This photo captures one of the larger pups we’ve ever seen practically Velcroed to mom. When she departs the roost to take flight, her wings extend nearly three feet in length (about a meter) from tip to tip. Of course, I’m anxious for her and the pup but she knows the routine by heart. She searches and finds lift that comes with each powerful stroke, altering an initial downward trajectory into one that elevates her into the dark canopy. Her flight path is littered with branches and liana vines but she gracefully avoids these obstacles. Once they are out of sight, I can finally exhale. I’m left with amazement and incredibly humbled by this brown-eyed flying wonder and her baby. 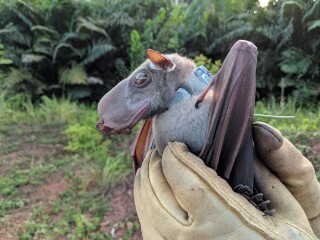 EDITOR’S NOTE: Read more about Sarah’s work and see the unique male hammer-headed bat on her other Wild View posts Hammer-headed Bat and Hammer-headed Bat Ambassador. Bat Week 2018 is October 24-31. Be at bat hero. Participate in our Wild View Bat Heroes Photo Contest to raise awareness and celebrate the role of bats. WOW! 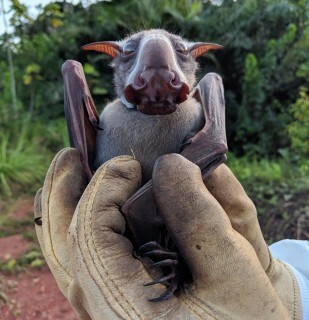 I’ve never even seen a pic of this kind of Bat before now. When I 1st saw the 1st pic. I didn’t know what in the world it was. It’s ugly but cute. I’ve never seen this type of bat! I just love bats. Like snakes, they get a bad rap, and that’s not fair. They’re so beneficial! Just like the blacksnake around my home that keeps the mice population in check! I love animals, all animals are beautiful. Every living organism life matters!!! Gotta love’em. I’ve been a bat fan all my life. I also have never heard of Hammer Head bats, interesting. Never letup on those who would treat our lives to pollution’s of all sorts! REALLY COOL! Every once in awhile I see a bat where I live by wine-country (SO CAL). I am grateful because I know the bats eat mosquitos.